Buoyed by demands from new-age tech-based sectors like e-commerce and on-demand service providers, leading B-schools in India are seeing a sustained and all-round rise in recruiter sentiment. April 2014:Three young graduates from the Indian School of Business ventured out to life after B-school. Ankur Majumder joined Yes Bank, Satish Gupta opted for Baker Hughes, a leading oilfield services company, and Siddharth Arora took charge as product manager at Rummycircle, an online gaming portal. Sixteen months later, the three quit their jobs to co-found Turant Delivery. Its USP: an on-demand logistics aggregator - a product they feel has the potential to be the backbone of the e-commerce industry. "We did not want to miss out on the exponential growth (of e-commerce)," says Arora. "The fear of losing out" not only made them start out on their own, but also made leaving stable jobs "a risk worth-taking". The actions of the trio are really a reflection of the mood among the new management graduates in India today - jumping into a space that has the potential to scale up quickly; finding a challenging role and exploring untested waters. 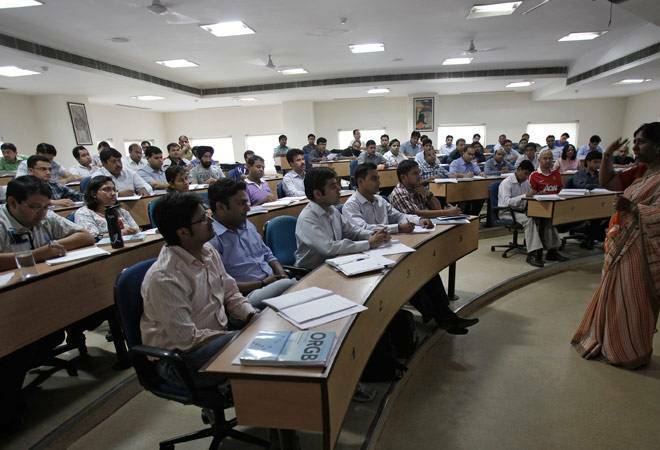 As opportunity beckons talent, it is not surprising, therefore, that this year's Business Today-MDRA survey of 269 of India's Best B-schools finds that this is, perhaps, the best time to be a student of business management. Especially, for those in leading B-schools, where recruiters compete fiercely to hire. 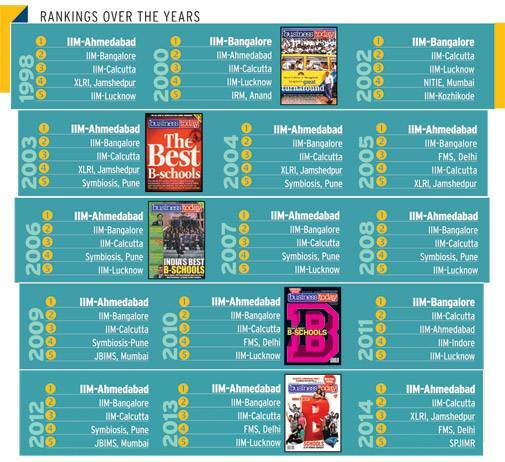 The pecking order of the top 10 B-schools is led by IIM-Ahmedabad which has retained the top slot. Some others have been consistently moving up the charts to emerge as the front runners in the Indian business and management education space. For instance, Mumbai's S.P. 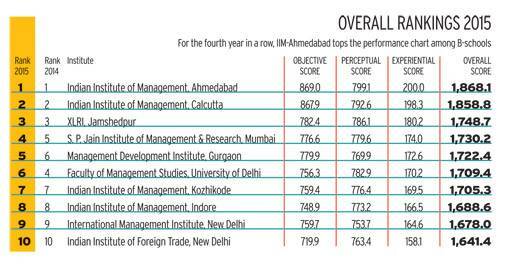 Jain Institute of Management and Research (SPJMIR) has moved up to the fourth position this year against the 2014 survey. It's a significant progress since its seventh position in 2013. Similarly, Management Development Institute (MDI) made it to the fifth rank this time, up from sixth last year and eighth in 2013. If names of a few other reputed schools are missing from the list, it is because this time, too, institutes such as IIM-Bangalore and IIM-Lucknow stayed away from the survey. Some of the others did not submit their objective data on time or did not participate. As always, there is significant learning from the sub-text and parameters of the survey. For example, when it comes to future orientation, it is IIM-C and SPJIMR and not IIM-A that score higher. The common thread across campuses was better placements. What stood out about the placements in the last academic year - and expected to accentuate this year - is a mix of factors. First, there was an increase in the breadth and depth in the offers in the form of a higher number of sectors represented on the campus. Among sectors, besides the traditional recruiters such as Banking and Financial Services (BFSI) and consulting, the year saw the return of the finance, PE and VC firms. 'While traditional sectors have continued to hire, the buoyancy came from e-commerce,' says Ajit Rangnekar Dean, ISB. For instance, the PGP final placements 2015 at IIM-A, which completed the process in March, saw participation from Accenture Strategy, Alvarez & Marsal, Bain & Company, Deloitte and McKinsey & Company, among others from the consulting space. The BFSI sector was dominated by global investment banks such as Avendus Capital, Citi, Credit Suisse and Goldman Sachs. The private equity and venture capital space saw participation from Matrix Partners and Apollo Global Management. What perhaps stood out was the emergence of Internet and e-commerce, and technology companies as major recruiters with participation of companies like Amazon, Flipkart, OlaCabs, Quikr, Snapdeal and Uber (see The Great Talent Exodus on page 134). 'There is an obvious disruption in the B-school talent market today,' says Prabir Jha Global Chief People Officer, Cipla. In terms of depth, within each sector, there were more roles on offer. For instance, in Internet and e-commerce, besides established roles such as product manager, category manager and account manager, there were openings in digital marketing, data analytics, operations and supply chain. In effect, there was a role for everyone. Second, as recruiters jostled for talent, salary on offer rose substantially, thanks to Internet and e-commerce companies. After all, every recruiter was competing for the same pool of students that the traditional players from consulting and FMCG were targeting. The only way to sweeten the deal was by offering new roles and higher salaries. Typically, these companies offered packages up to 25 per cent higher than what traditional recruiters were offering. 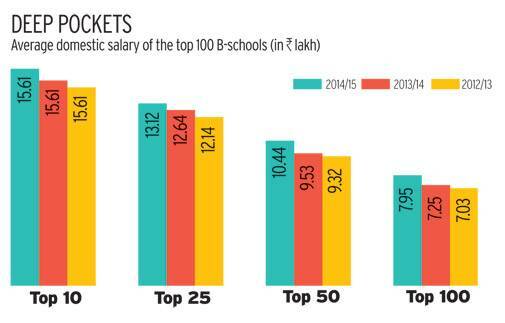 Consider this: The average salaries offered to students at IIM-A, for instance, has been steadily increasing from Rs 18 lakh per annum two years ago to around Rs 20 lakh last year. This year, students expect it to touch Rs 23 lakh. In comparison, some Internet and e-commerce firms offered between Rs 28 lakh and Rs 29 lakh. Talk to deans, directors, placement heads, students or HR executives across companies on the recruiter sentiment and the first few minutes of the conversation linger around the emergence of e-commerce and other "new age sectors" emerging as the biggest recruiters at B-schools. 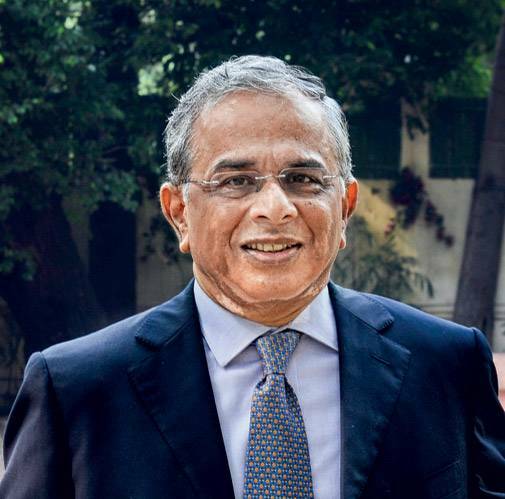 "While traditional sectors like consulting, finance, FMCG have continued to hire, the buoyancy came from e-commerce," says Ajit Rang-nekar, dean of Indian School of Business, which ranks second in our rankings of one-year MBA schools. What he is referring to is the technology-based companies. Be it horizontal e-commerce players such as Flipkart and Amazon; search-and-second-hand product marketplaces such as Quikr; or, on-demand companies like Ola, this trend has particularly accelerated in the past one year with almost one-fourth of all offers coming from such companies. OlaCabs alone, for instance, hired 50 graduates from top six schools last year. "We are up by over seven times the number we recruited in the previous year," says Amit Mathur, Director and Head of Talent Acquisition at Ola. Rangnekar sees a gradual trend in preferences for jobs in the operations area as against pure strategy, consulting or marketing earlier. In the case of the leading B-school, IIM-A, a fifth of the total number of students from the last batch opted and accepted jobs in the e-commerce space. Or, say, at SPJIMR, e-commerce emerged as the largest sector with 23 per cent of the total students getting into the sector, compared to 15 per cent earlier, when FMCG was the leader taking in 22 per cent of the total number of students. Or take XLRI, for instance. In the 2013/15 batch, 8.4 per cent of the 300 students, or 25 students, got placed in e-commerce as against 4.08 per cent out of 245 students, or 10 students, in the 2012/14 batch. Others have also similarly seen a rise in the share of e-commerce. Another reason why there is so much noise around Internet and e-commerce companies is because it is only from the last academic year that many of these companies, armed with funding and talking scale, started moving to B-school campuses. Before that, e-commerce players mostly focused on technical talent through technical colleges rather than management schools. 'The next growth driver will come from sectors where there's an interface between technology and finance,' says Ranjan Banerjee Dean, SPJIMR. 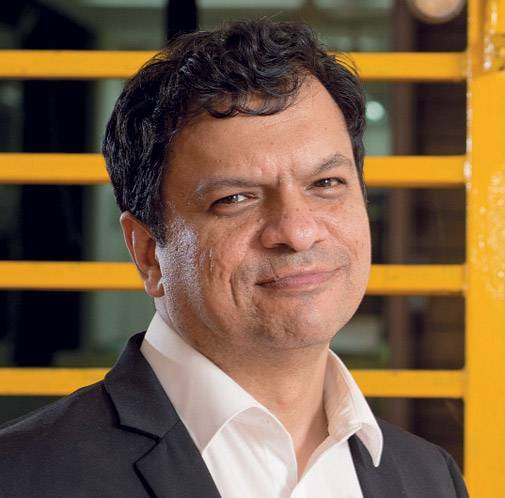 Ola's Mathur told Business Today that the company will hire more freshers from B-schools. "This increase is primarily because of the phenomenal growth we have seen. We have expanded to 102 cities, serving millions of customers and hundreds of partners everyday....we are looking at hiring talent that is willing to bring a fresh perspective. 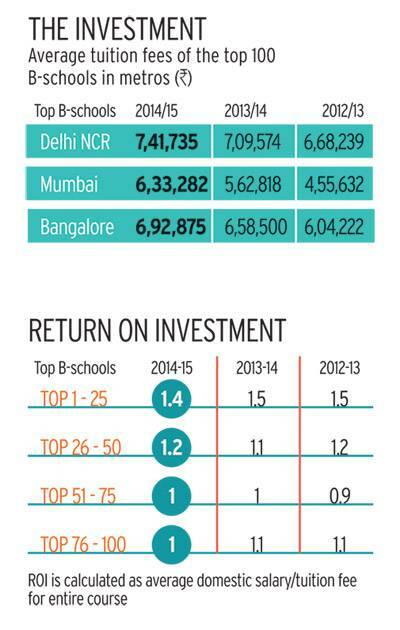 Clearly the top B-schools bring together the best young minds." Hiring from these campuses, in his view, is also important for the company, given that it is "doing something that has never been done before". "At every step, we have leveraged the on-demand technology (that we have built), which essentially connects the customer and the service provider seamlessly, within minutes and we are working towards our vision of mobility for a billion people." Students are obviously thrilled about the higher compensation alongside the new and challenging roles. These are aspects that could have a bearing on traditional sectors like FMCG, manufacturing and consulting. Take the case of Nitin Agarwal, Assistant Vice President, Marketing, at Shopclues, for instance. 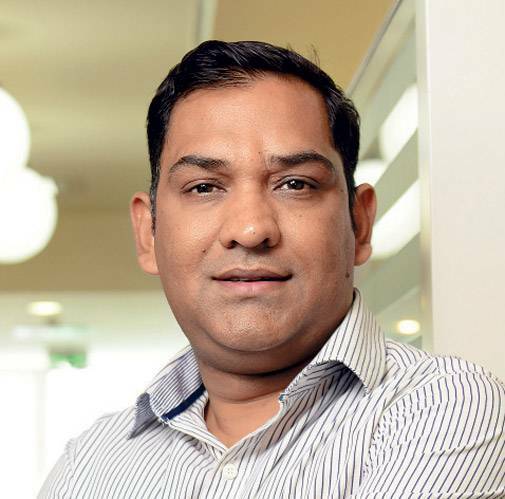 The former Ashok Leyland and Gulf Oil employee, who joined the e-commerce site three years ago as a product manager and moved up the ladder to head the marketing division of the company, says: "Shopclues is not profitable at the moment, but thats our business choice. We want to invest in business and business growth. The kind of growth I have got here I could have never imagined getting it in a traditional sector company." Says Prabir Jha, Global Chief People Officer at Cipla: "There is an obvious disruption in the B-school talent market today. Traditional favourites will need to add a new zing to their offerings to be competitive. An obvious focus will be to look for people with a passion for a specific segment." Jha, an XLRI alumnus and one who has a feel from across sectors, having earlier led HR and people functions at Reliance Industries and at Tata Motors, says: "They (the companies) will need to decide if they want just a ticket to play or a ticket to win." But then, it is not as if the demand from new sectors has in any way slowed down the non-technology companies or the traditional recruiters as they continue to hire. Consulting, for instance, is still growing while marketing is sustaining its growth. The key point being that if there is demand from new players and traditional recruiters are also growing and hiring, it means more competition for talent and also more choices for students. Along with the earlier preferences for sectors such as consulting and marketing, now there are others such as finance and e-commerce that are in high demand as well. It is not without reason, therefore, that leading schools, including IIM-A, are planning for tomorrow. "Placement outcomes are significantly influenced by business cycles and are only one measure of how the students are doing," feels Ashish Nanda, director, IIM-A. It is with good reason that IIM-A and others are planning for the future. "While ecommerce has been an important growth driver and will probably stay so next year too, I feel, we will see the next growth driver coming in the form of those sectors where there is an interface between technology and finance," says Ranjan Banerjee, Dean at SPJIMR. He is taking a cue here from the emergence of mobile wallets, a variety of payments banks, small finance banks and other banks, and, it is quite possible that in another three to four years they will make their way to the campuses. More on this in our next essay on how the leading B-schools in India are leveraging their strengths and preparing for future.